There’s a new drink book, Viva Mezcal, that I’m working my way through. It offers this drink, Sunset in the Sur, that tempted me because of the ingredients: St-Germain elderflower liqueur, grapefruit juice, lime juice, and naturally mezcal. Mezcal is the intense sibling of tequila. It’s lovely if you enjoy smoky. Let’s just say I’m adjusting. That smoke hits your nose just as the glass approaches, before the first sip. I did appreciate this cocktail, which I drank with NO cava to top it off. I wanted to grab the full intensity of the mezcal with the other flavors. I think this drink grabbed me instead. Try the recipe as shown here and do top off with some sparkling wine. It tames the smoky beast. 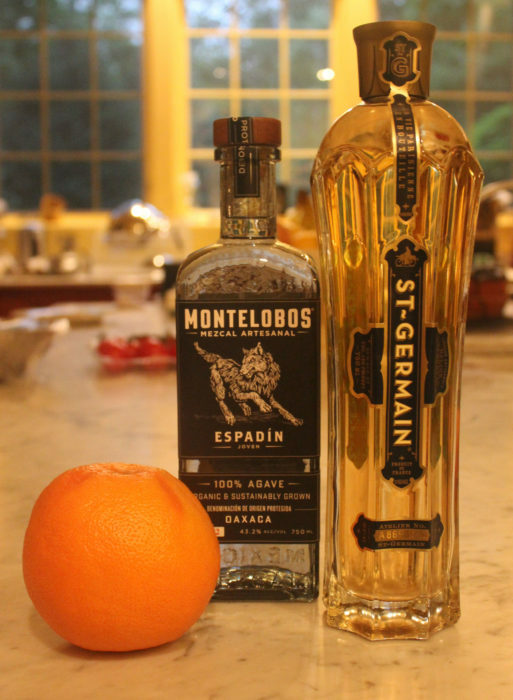 In a cocktail shaker with ice, vigorously shake together the mezcal, St-Germain, lime and grapefruit juices until cold and well-blended. Strain into a flute glass and top off with sparkling wine, preferably cava. Garnish the glass with a shaving of grapefruit peel.